From TRD NYC: U.S. Presidents have typically made bank after leaving office, mostly through speech tours and book deals. President Trump appears to be taking it to the next level by enriching himself while still in office, in spite of promises to draw a “red line” between himself and his companies. 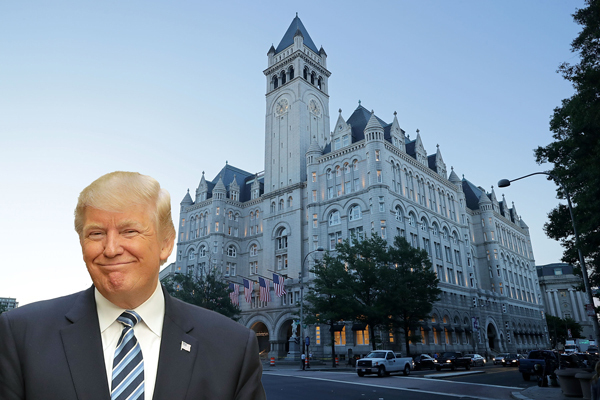 A year ago, Trump promised that he would donate any profits from foreign governments booking rooms at his hotels to the U.S. Treasury. That hasn’t happened yet, according to a new report by the Associated Press. Trump officials, who at first promised to donate the money by late 2017, now tell the AP that they will have “information to share” in late February. The Trump Organization has also doubled the membership fee at the Mar-a-Lago golf club in Florida to $200,000 since the election. Trump regularly visits the club and ethics watchdogs worry that people could use memberships to lobby him. “My overall ethics grade for the Trump administration is an F,” Washington University School of Law in St. Louis ethics lawyer Kathleen Clark told the AP. Trump Organization lawyer Alan Garten countered that the firm is trying hard to avoid ethics conflicts. “I feel very confident that we are meeting our obligations,” he told AP.